You never know when you're going to see a leopard. Mrs Blog and I have had some of our best leopard sightings in the middle of the day and this one (above) was one of those. We were on our way from Pretoriuskop in the Kruger Park to the luxurious Tinga Private Game Lodge (the setting for my fifth book, SILENT PREDATOR) to visit a reader who had booked out one of Tinga's two camps in its entirety for his 70th birthday. Mrs P and I were more intent on thoughts of a gourmet lunch and a splash in our private plunge pool than animals, and it was a stinker of a day so we didn't expect to see much. As we crossed the river near the Delaporte water hole, not far from Skukuza, Mrs B yelled out "STOP." which is a sure sign that I'm either snoozing and veering off the road, or that there is an interesting animal to be seen. Fortunately it was the latter. "Oh baby, come with me to zee casbah... I wish to 'old you in my arms and..." We came across Pepe le Pew (above) and his significant other near Dom pan in Hwange National Park, Zimbabwe (there is, as you can see, no particular order to these pictures. This one was taken a few weeks ago). This very healthy mating pair of lions were at it, in true lion fashion, about every 10 minutes. It's good to be the king of the beasts, but hard work sometimes. And here he is (above), showing his Angry Dragon face. 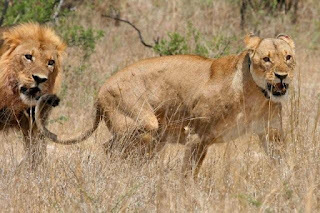 These two lions were both collared, which made taking pics of them quite hard. However, they were both in magnificent condition. Here's the male again, looking quite tough, but in fact he's (literally) shagged out. Moving right along, and again in no particular order, above we have a picture of a Yellow Billed Kite teaching a frog how to fly. 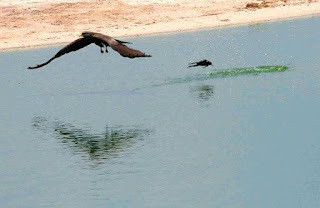 Mrs Blog and I sat for ages at Guvalala Pan, in Hwange, watching a squadron of Kites snatching frogs from the waterhole. Kites aren't (as far as I know) great fishing birds, but the masses of forgs in the waterhole represented a target-rich environment for these Top Guns. Time after time each bird swooped and picked up a big fat frog. Sometimes they were successful, and landed nearby for a meal of frog's legs and gizzards, but often the slippery suckers would slide from their talons. This frog (probably one of the lucky ones, if he survived his first flight) bounced, dambuster-bomb-style, along the surface of the pond. And to round things off it's back to Kruger again. 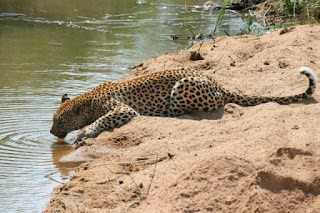 I took this pic in the Tinga Private Game Lodge concession, on the banks of the Sand River. This lady and her family were busy devouring a kudu, and she'd taken a breather (a panter, actually) to try and digest her dinner. This sighting was during the fabulous SILENT PREDATOR SAFARI in which eight lucky readers enjoyed some truly magnificent game viewing in between their bubble baths and sumptuousfeasts at Tinga. 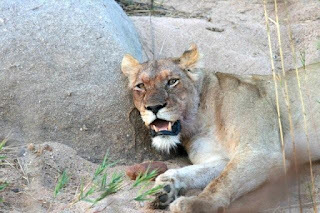 If you're interested in coming on safari with me in Africa in 2010, drop me a line at tonyparknews(at)gmail (dot) com and I'll put you on my newsletter distribution list. The newsletter will have details of future tours, and more pictures to make you wish you were here, with me, in Africa. 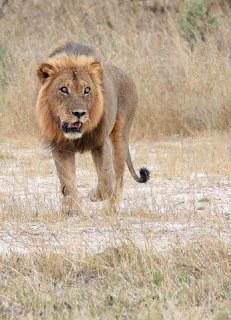 Having just read Martie's blog and seen her 'lion kill' photos what an excellent treat to have a follow on with your super photos. Wonderful photos - thank you!! BTW, Dozy, had a wonderful trip, with many many happy memories. Walks were fantastic - the best part of the whole trip for me. Are you planning on doing any walks while your there Tony? Thanks all, and I should point out that Mrs Blog took that excellent leopard pic. Yes, Timepilot, we are probably going to do a walk from Pretoriuskop, where we are now. It's always fun doing a walk from here as you're virtually guaranteed to find rhino. Lovely photos - really makes you keen to travel. I've had a few days worth of your blogs to catch up on and haven't quite got to the latest yet- what an amazing woman Martie is - i wouldn't even travel Oz on my own let alone anywhere else, so hats off!